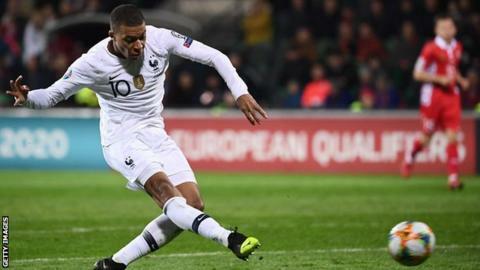 World champions France began their Euro 2020 qualifying campaign with a comfortable victory against Moldova. Atletico Madrid forward Antoine Griezmann opened the scoring after converting from Manchester United midfielder Paul Pogba's superb pass. Raphael Varane headed in the second and Chelsea striker Olivier Giroud netted a third before half-time. Paris St-Germain star Kylian Mbappe stroked in a fourth before Vladimir Ambros scored for the hosts. In the night's other Group H games, Iceland won 2-0 at Andorra while Turkey won in Albania by the same score. Match ends, Moldova 1, France 4. Second Half ends, Moldova 1, France 4. Kylian Mbappé (France) is shown the yellow card for a bad foul. Kylian Mbappé (France) has gone down, but that's a dive. Goal! Moldova 1, France 4. Vladimir Ambros (Moldova) left footed shot from the left side of the six yard box to the bottom left corner. Vitalie Damascan (Moldova) hits the right post with a header from the centre of the box. Assisted by Radu Ginsari with a cross. Corner, Moldova. Conceded by Samuel Umtiti. Attempt blocked. Radu Ginsari (Moldova) right footed shot from the right side of the box is blocked. Goal! Moldova 0, France 4. Kylian Mbappé (France) right footed shot from the centre of the box to the bottom left corner. Assisted by Thomas Lemar. Attempt missed. Nabil Fekir (France) left footed shot from outside the box is too high from a direct free kick. Vladimir Ambros (Moldova) is shown the yellow card for a bad foul. Nabil Fekir (France) wins a free kick in the attacking half. Foul by Vladimir Ambros (Moldova). Corner, Moldova. Conceded by Benjamin Pavard. Offside, France. Thomas Lemar tries a through ball, but Kylian Mbappé is caught offside. Substitution, France. Nabil Fekir replaces Olivier Giroud. Offside, France. Paul Pogba tries a through ball, but Kylian Mbappé is caught offside. Attempt missed. Paul Pogba (France) right footed shot from outside the box is close, but misses to the left from a direct free kick. Vitalie Damascan (Moldova) is shown the yellow card for a bad foul. Kylian Mbappé (France) wins a free kick in the attacking half. Foul by Vitalie Damascan (Moldova). Substitution, France. Thomas Lemar replaces Antoine Griezmann. Substitution, France. Florian Thauvin replaces Blaise Matuidi. Substitution, Moldova. Vladimir Ambros replaces Alexandru Antoniuc. Foul by Paul Pogba (France). Veaceslav Posmac (Moldova) wins a free kick in the defensive half. Corner, France. Conceded by Alexei Koselev. Attempt saved. Paul Pogba (France) header from the centre of the box is saved in the bottom left corner. Assisted by Antoine Griezmann. Antoine Griezmann (France) wins a free kick in the attacking half. Foul by Radu Ginsari (Moldova). Attempt saved. Kylian Mbappé (France) left footed shot from outside the box is saved in the bottom right corner. Assisted by Antoine Griezmann. Hand ball by Eugeniu Cebotaru (Moldova). Attempt missed. Benjamin Pavard (France) right footed shot from the right side of the box is high and wide to the left. Attempt saved. Paul Pogba (France) right footed shot from outside the box is saved in the bottom right corner. Assisted by Antoine Griezmann. Attempt missed. Alexandru Antoniuc (Moldova) right footed shot from long range on the right misses to the right. Assisted by Radu Ginsari. Alexandru Antoniuc (Moldova) wins a free kick on the right wing. Foul by Antoine Griezmann (France). Oleg Reabciuk (Moldova) wins a free kick in the defensive half.